Clown Knifefish, Chitala chitala, found in a coldwater pond in the New England state of Vermont. A Vermont man discovered something highly unusual while fishing outside of the Vermont State Capital of Montpelier last week. 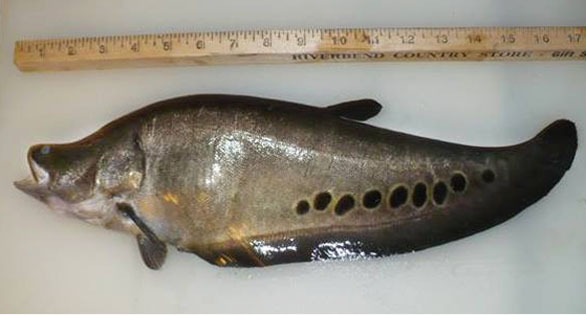 An exotic fish species known as a Clown Knifefish, native to Southeast Asia, was found dead near the boat ramp on North Montpelier Pond, a water reservoir and popular fishing lake covering about 72 acres. The angler took a photo of the fish and contacted Shawn Good, fisheries biologist for the Vermont Fish & Wildlife Department, to identify it. Although the specimen discovered in North Montpelier Pond was only 17 inches (43 cm) long, the species is capable of growing to nearly 40 inches (102 cm) and has the potential to be a voracious predator of other fish. They cannot survive in temperatures below 55 degrees Fahrenheit, so this one may have quickly perished in the cold water. There have been dozens of known introductions of invasive species into North American waterways from people releasing aquarium species, including fish, plants and invertebrates. These infestations can devastate native aquatic ecosystems, introduce disease, disrupt recreational and commercial fisheries, and cost millions of dollars for control and management. Releasing aquarium fish and many other fish species into Vermont waters is illegal and punishable by a fine of up to $500. Slow freezing is no longer considered a humane method of euthanasia of tropical fish. While it would seem the fish would be rendered insensable prior to the painful formation of ice crystals in the body, it is felt that is not the case. Perhaps there is new research on this I’m not aware of? Nevertheless, most anything is preferable to the “free Willy” method this fish owner used. Fish really can’t sense much pain at all, since they only have a fraction of the C-type trauma receptors in a cutaneous nerve when compared to a human cutaneous nerve; this was shown to be true on the rainbow trout. *Scientific studies have shown that sharks, skates, and rays are virtually incapable of feeling pain because they lack the necessary fibres. Fish may not feel much pain at all in any case, but I don’t believe anything should be put through unnecessary pain if at all possible. Of course, I do not agree at all with freezing, boiling, or microwaving live fish for first-choice methods of their euthanization. I suggest the use of clove oil, however, as this is a powerful sedative to fish (I have had to do that with a few of my own catfish when they were losing to terrible bacterial infections that I was unable to treat). I also do not defend the introduction of invasive species; particularly if the release was or ever is made with intent to destroy natural ecosystems. I do believe, however, that with lost causes (with Asian Carp and Snakeheads as examples) we should just make do with what the situation presents: both fish are good for food. I don’t believe someone who has ignorantly made a choice to release an exotic species should be treated as though he/she was a criminal, but should still be disciplined and educated on how his/her choice would affect the environment. Just slapping a $500 fine on someone in that case doesn’t do much good in my point of view. The species commonly found in the aquarium trade in the U.S. is Chitala ornata (which is the one in the picture), not C. chitala. Slow freezing is no longer considered a humane method of euthanasia of tropical fish. While it would seem the fish would be rendered insensable prior to the painful formation of ice crystals in the body, it is felt that is not the case. Perhaps there is new research on this I'm not aware of? Nevertheless, most anything is preferable to the "free Willy" method this fish owner used.